Our elegant table lamp showcasing a magnificent pineapple, the symbol of hospitality since Colonial times, makes a stunning decorating statement for home or office. The lamp base is intricately cast of solid brass with a lustrous, tarnish resistant, antique brass patina; and crowned with an off-white hexagonal silky fabric shade and decorative pineapple finial. Features a 3-way socket that takes a 100W maximum bulb (not included). Measures approximately: 22"H x 11"W x 11"D.
The Pineapple is the symbol of hospitality and welcome, what better accent to add to your home. 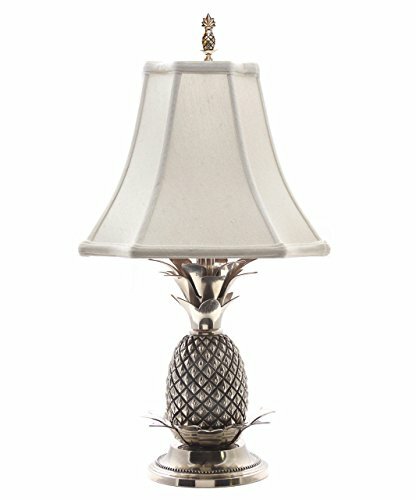 This elegant pineapple table lamp in antique brass with off white shade will bring warmth and style to your home. The lacquered finish will not tarnish and is very easy to maintain. The lamp is hardwired with a 3-way socket, bulb is not included. The brass casting is made in India the silk shade is made in China and the lamp is assembled in the US. 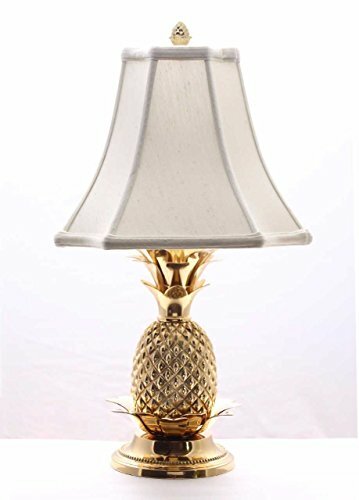 Our elegant table lamp showcasing a magnificent pineapple, the symbol of hospitality since Colonial times, makes a stunning decorating statement for home or office. The lamp base is intricately cast of solid brass with a lustrous, tarnish resistant, polished brass patina; and crowned with an off-white hexagonal silky fabric shade and decorative pineapple finial. Features a 3-way socket that takes a 100W maximum bulb (not included). Measures approximately: 22"H x 11"W x 11"D.
The Pineapple is the symbol of hospitality and welcome, what better accent to add to your home. 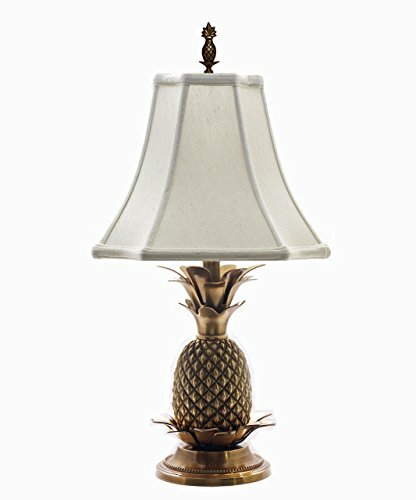 This elegant pineapple table lamp in polished brass with off white shade will bring warmth and style to your home. The lacquered finish will not tarnish and is very easy to maintain. The lamp is hardwired with a 3-way socket, bulb is not included. 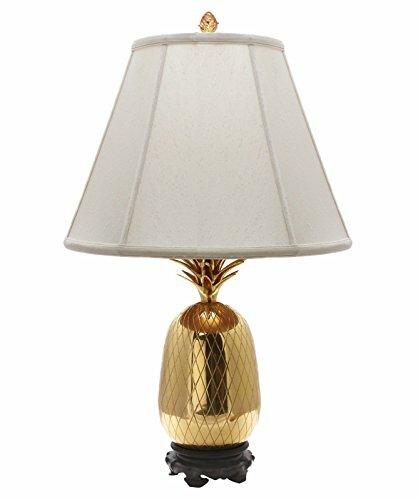 The brass casting is made in India the silk shade is made in China and the lamp is assembled in the US. 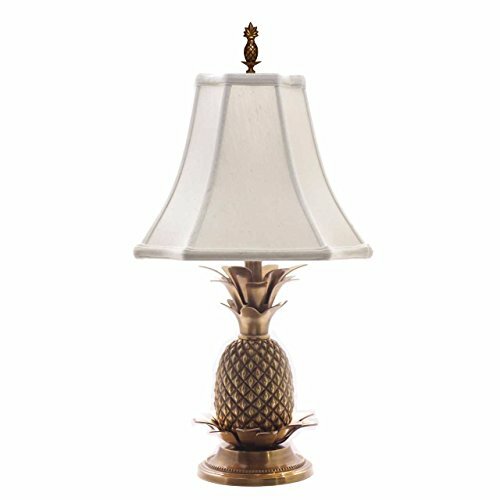 Our elegant table lamp showcasing a magnificent pineapple, the symbol of hospitality since Colonial times, makes a stunning decorating statement for home or office. The lamp base is intricately cast of solid brass with a lustrous, tarnish resistant, pewter patina; and crowned with an off-white hexagonal silky fabric shade and decorative pineapple finial. Features a 3-way socket that takes a 100W maximum bulb (not included). 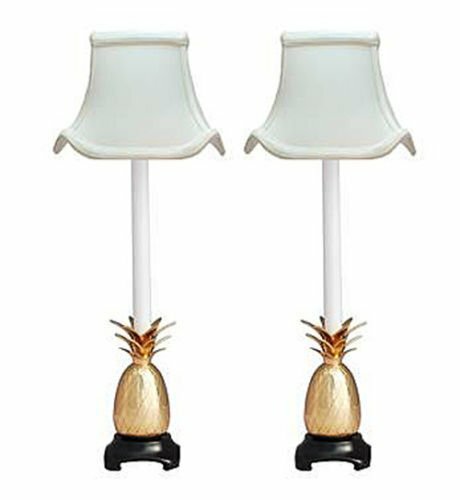 Measures approximately: 22"H x 11"W x 11"D.
Our elegant pair of buffet lamps showcasing a magnificent pineapple, the symbol of hospitality since Colonial times, make a stunning decorating statement for home or office. The lamp bases are intricately cast of solid brass with a lustrous, tarnish resistant, polished brass patina and are crowned with off-white pagoda shape silky fabric shades. Features an on/off inline switch on the cord. Takes a 25W candelabra base bulb (not included). Measures approximately: 21"H x 8"W x 5.5"D. Sold as a pair. 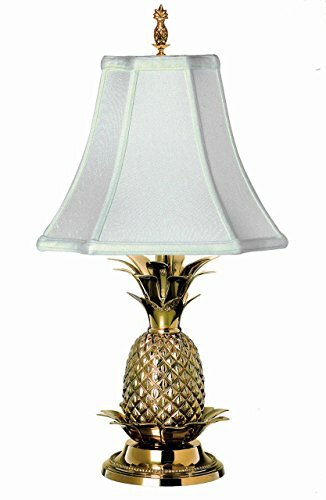 Our elegant mini accent lamp showcasing a magnificent pineapple, the symbol of hospitality since Colonial times, makes a stunning decorating statement for home or office. The lamp base is intricately cast of solid brass with a lustrous, tarnish resistant, polished brass patina; and crowned with a silky off white empire shape, clip on fabric shade. Features an on/off socket with an inline switch on the cord that takes a 25W maximum bulb (not included). 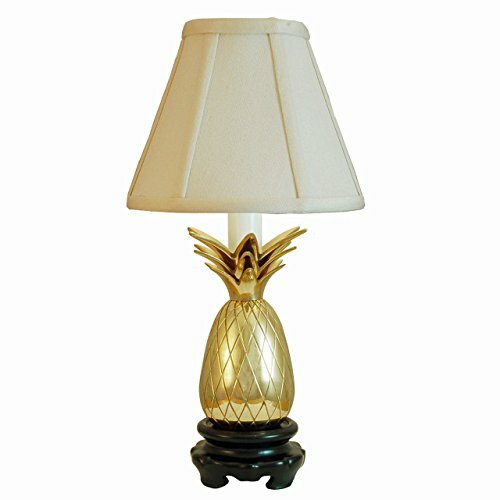 Measures approximately: 11"H x 6"W x 6"D.
Our elegant table lamp showcasing a magnificent pineapple, the symbol of hospitality since Colonial times, makes a stunning decorating statement for home or office. The lamp base is intricately cast of solid brass with a lustrous, tarnish resistant, polished brass patina; and crowned with a silky off white empire shape fabric shade and decorative finial. Features a 3-way socket that takes a 100W maximum bulb (not included). Measures approximately: 27"H x 16"W x 16"D.
Looking for more Brass White Shade Pineapple similar ideas? Try to explore these searches: Marlin Magazine, Irrigation Moisture Sensors, and Papaya Almond. Look at latest related video about Brass White Shade Pineapple. Shopwizion.com is the smartest way for online shopping: compare prices of leading online shops for best deals around the web. Don't miss TOP Brass White Shade Pineapple deals, updated daily.